2017 is bound to be an interesting year for SEO experts. However, SEO remains a game that requires a business to always stay ahead of competitors. A great way of accomplishing this dominance and competitiveness is being aware of the latest trends in the industry and adjusting your strategies before your competitors. Internet users are no longer interested in reading fluff content repeatedly. Over the recent past, readers have preferred “epic” content. This includes long blog posts that cover topics comprehensively. However, since the market is being flooded with such content, the newest trend is ignoring length and focusing on more informative content that occupies small space. Thus, dense content is now appealing to more readers. Accelerated Mobile Pages or AMPs refer to an open-source protocol where webmasters create pages that load on mobile devices almost instantly. Ideally, some structural changes may seem simple but they can make a website load faster and use less data. Currently, Google favours AMPs websites. This means that more Australian businesses will most likely take advantage of AMPs in 2017. It’s no secret that when it comes to impressing visitors, speed matters. That’s why Google favours websites that load quickly with proper optimization for mobile devices. This is because these websites provide an enjoyable experience to the users. However, in 2017 user experience may be emphasized more. That’s because it is related to mobile devices. AMPs may be the first indicator of this. Nevertheless, there may be other ways via which Google will show favouritism for websites that provide ultimate user experience. Social media has taken the centre and front part when it comes to SEO and digital marketing. Currently, search engines are giving social media pages top ranking preferences. That means if a business lacks social media presence, its SEO strategy will definitely suffer. Almost every business needs a digital marketer or an SEO specialist. However, 2017 requires more sophisticated specialists. These are professionals with experience and knowledge of how search engines work and how target prospects perform online searches. Knowledge in the use of personal tools like Cortana and Siri, which make lives simpler, will also be important for SEO specialists since these might mark opportunities for new rankings. Over the last years, SEO options for mobile apps have increased significantly. From deep linking and basic indexing for apps to content in the apps, app streaming has developed immensely. This enables users to stream the content of the apps without downloading and installing apps in their devices. Currently, Google caters for the users of these apps without alienating their core functions in the search engine. However, Google might show further favouritism for apps in 2017. Although it might be early for apps to replace websites altogether, this might be a step towards this path. It’s not easy to determine what exactly the search engines plan for us this year. However, these are the latest SEO trends to watch out for as the year unfolds. Lemotion Wedding Films, a creative story telling wedding video company based in Sydney that offers unique and compelling cinematic wedding films that will leave you breathless. To go up against the big players in the market and dominate Page 1 of Google and drive more traffic and leads to the website. Increase online visibility and brand exposure. Performed overall website assessment, health check & gathered requirements. Created unique SEO Strategies based on what LeMotion needs to achieve our goals. 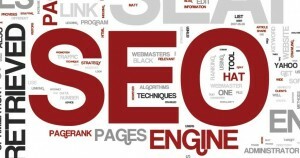 Implemented these Custom SEO strategies. Acquired high authority backlinks, citations and other forms of effective ranking signals to propel their rankings. Mission accomplished! LeMotion is now on Page 1 and high Page 1 of Google for competitive keywords, SEO traffic & leads have increased. Louie and their team are THE BEST digital marketing experts (SEO) in Sydney, Australia ever, the result of their work even helped us reach out audiences from many corners of the world! Just check out these amazing results, the benefits to us are beyond these numbers, it has established us to become one of the leading videography company in Sydney, well done Louie and team, we thank you forever! 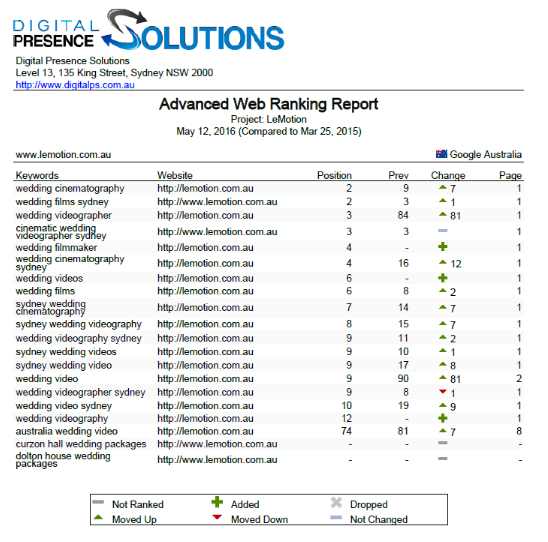 Want to be up there in Google too and improve your digital presence? Contact us today here at Digital Presence – 02 8973 7488 or via our contact form, lets talk soon! Google has made it necessary, especially in the last 12 months to promote websites higher on their search engine results that are compliant with their on page SEO. What this means is that your website has to be spick and span in terms of everything Google has every wanted if it is going to rank. One of these factors determining your position on Google is your content marketing. This article will explain the benefits of content marketing and how you need to start incorporating this into your SEO strategy if you expect to see some kind of ranking improvement. Firstly, you need to put a blog on your website. Most sites will have these but ask yourself when was the last time you published a blog. If the answer is more than a month ago, then you need to start writing content about your business, any industry news and any bits of information that are relevant to your business sector. This has to be done regularly and I want to stress a really important point here; it must be unique content. Google and it’s algorithm loves to publish new content that is considered valuable. If you meet this criteria then your blog posts will be published. In turn, you will start to dominate your niche through this type of marketing. Believe me it works. You also need to take a long hard look at your website and go through each and every page to make sure that they are not too thin on content. Each page must be over say 500 words in order to satisfy the Panda algorithmic update. If you can see that your web pages are too thin then you need to quickly beef then up with copy. This is also a ranking factor and something that Google takes very seriously. There is no way to hide or get around this as you are dealing with an abstract algorithm that is programed for one thing and one thing only; to detect well versed copy. Another great content marketing tip is to have a look at your social media and how you publish content in this area. Social media is now considered a serious ranking signal to Google, so make sure you are actively publishing content and promoting your business on these digital marketing platforms. If you have never done this type of thing before and you are probably shaking your head wondering how on earth are you going to start this. Well, it’s simple. You just need to get along and start writing. If you feel you do not have time or inclination to do this, then I really suggest and urge you ( if SEO and your Google rankings are important to you), to get in touch with us here at Digital Presence Solutions. 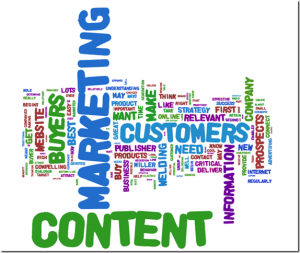 We can not only help with your natural SEO ranking, but we can also do all of your content marketing.